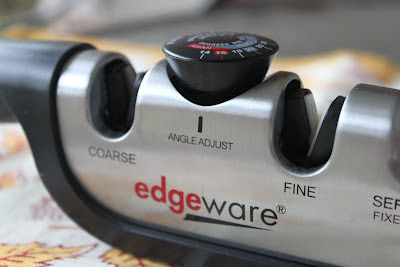 So, when I got the chance to test and review the Edgeware Angle Adjust Manual Sharpener by Smith's, I was pleased to find a knife sharpener that I could easily use myself. Another feature of the sharpener is a knob that helps you to adjust to the correct angle of your knife and the soft touch hand grip which provides a safe, no-slip base for stability. 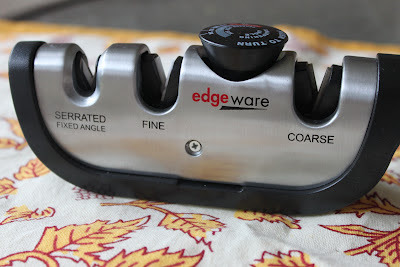 The Edgeware Angle Adjust Manual Sharpener has made knife sharpening so much easier for me. 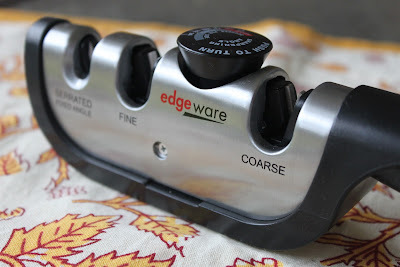 And, since I've become more confident with sharpening my knives myself, I tend to sharpen them more often which makes for safer cutting and chopping in the kitchen. My sharp knives make me feel like a professional chef...almost. Disclaimer: I was provided with this product for review; however, the opinion expressed here is my own. My Tom, has a sharpener kind of like this and he does sharpen his knives more with it!